The African white-backed vulture or White-backed griffon (Gyps africanus Salvatori, 1865) is a bird of prey belonging to the order of the Accipitriformes and to the family of the Accipitridae. Very diffused in Africa, it is one of the most usual events for those visiting the immense savannahs inhabited by herds of herbivores while along with other vultures they feast around rotting carcasses. In Africa it may be mistaken with the Rüppel’s vulture (Gyps rueppellii) also typical African species with which shares most of its habitat even if this last results much less numerous than our white-backed vulture. An accurate analysis leads however to an easy distinction of the two species. Conversely, it would be more difficult to distinguish it from White-rumped vulture (Gyps bengalensis) species of the Indian subcontinent, once considerd as the most common vulture in the world, but as not having shared areas it is extremely rare to meet it together. The white-backed vulture stands among the biggest vultures, the most common in Africa. As is usual for these birds eaters of carrions, the white-backed vulture lives in numerous groups when looking for food, as well as during the nidification, and therefore it is even easier to observe it when in flight twirls very high signalling the presence of carrions or the proximity of their colony. It is a much careful cleaner to which nothing escapes and when one available corpse has been found may reach exceptional concentrations of some hundreds of individuals. Exceptionally, around the immense carcasses of elephants may gather unimaginable numbers of them. The etymology of the scientific name is quite easy, Gyps from the Greek “gups” = vulture and from the Latin africanus due to the area to which belongs. The European vulgar names remind faithfully the morphologic or geographic characteristics of this bird. 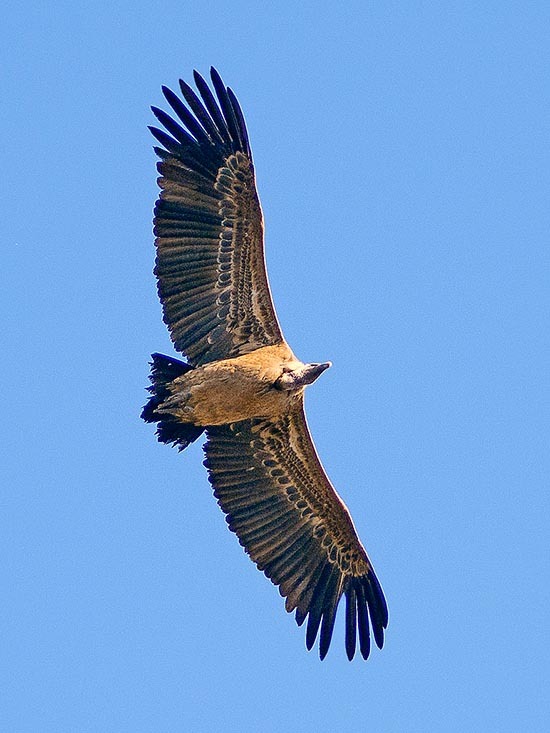 In English African white-backed vulture; in French Vautour africain; in German Weißrückengeier; in Spanish Buitre dorsiblanco africano. 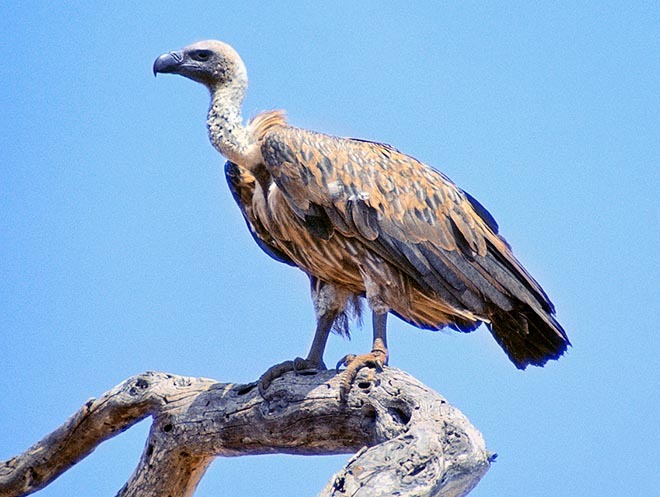 This vulture is spread in all sub-saharian Africa and frequents indifferently savannahs and pluvial forests. The northern limit of its range goes from Mauritania to Ethiopia to reach, through the whole continent, the extreme South African regions. It is less common in the central and western Atlantic part. It is not present in the open deserts but frequents also mountain zones and highlands, cultivation and humid zones and in whatever other area where it can find its potential victims. Quite often, flocks of these birds follow the herds of herbivores during their seasonal migrations, therefore it is surely the most adaptable vulture amongst its similars. Nowadays it often frequents the human dumps around the inhabited locations. It is found from sea level up to 3000 m of altitude. It’s not a migratory species though its movements, even for very short time, take them to distances that for other birds might appear as real migrations. They are by sure erratic in the periodic alternation of the dry or rainy seasons, but are absolutely sedentary during the long months seeing them engaged in the nidification. It is the vulture who has gotten more than any other a very strong decline and suffered in the time a pressing human persecution up to its elimination from some areas to then be able to slowly and partially reoccupy them, through a policy of strict protection and tutelage. This has occurred outside the greatest parks and in the ample protection areas created in the last decades in all Africa, whilst most affected have been the zones with strong human presence and submitted to intensive grazing. It has disappeared or is very rare in Ghana and in Niger, as well as in Nigeria where it appears as nowadays extinct. In this region it seems that one of the main causes has been the practice of the juju, a black magic similar to voodoo that foresees the sacrifice of blood of animals and once, alas, also of human beings, to obtain spiritual benefits from the afterlife. 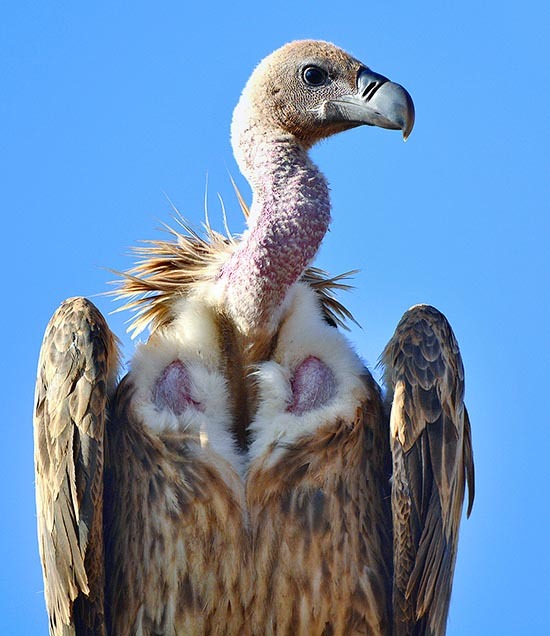 Also in South Africa has always been hunted along with other vultures for medicinal practices. Unluckily, other nations, like Kenya that has started since time measures to protect its presence, have been submitted during the last decades to consistant reductions. In the southern part of the continent, on the contrary, it has not seen major differences and the number results constant. 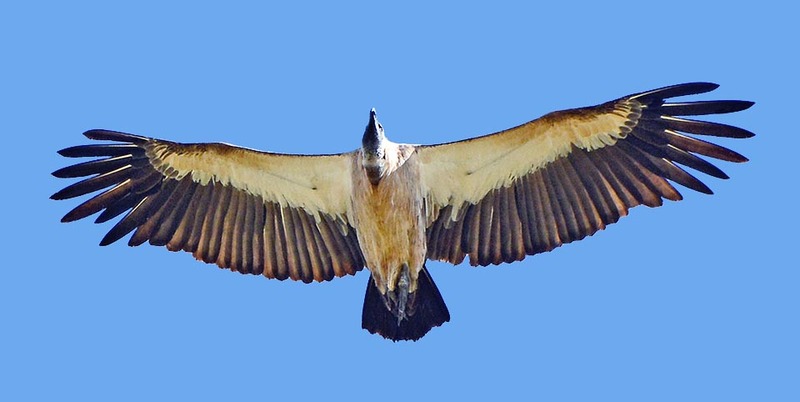 However, it is estimated that the overall number of this vulture in Africa is of about 300.000 specimens. 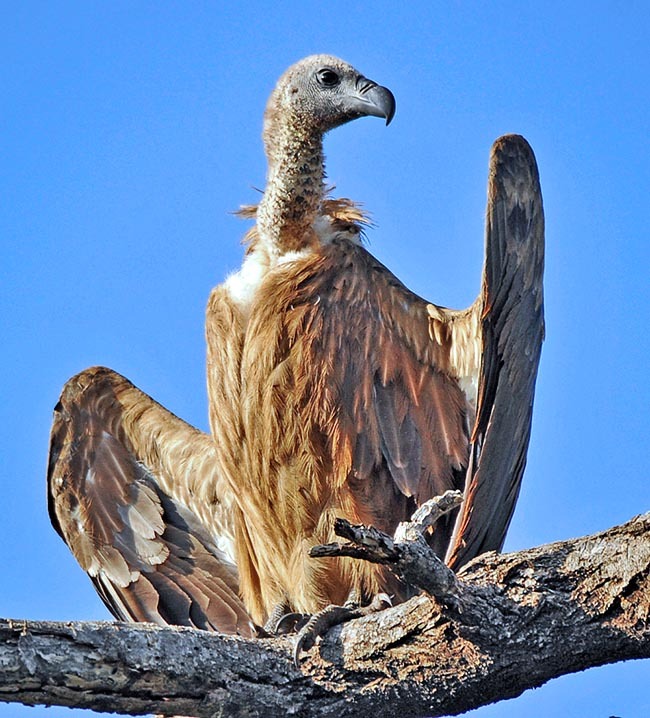 This vulture is one of the four vultures of the genus Gyps present in Africa, along with the Gyps rueppellii, the Gyps fulvus and the Gyps coprotheres species however endemic and isolated to very restricted areas of South Africa. It reaches the length of one metre and a wingspan of 220-230 cm. The weight usually varies from 4 to 7 kg, but at times may reach the 10 kg if the subject has participated to abundant banquets. Actually, it is well known that the weight of the saprophagous birds undergoes this variation every time they have the possibility of having access to large quantities of food. It is not unusual to see a huge number of these vultures, all clumsy, dishevelled and dozing close to the carcasses, not any more interested to the still available food but so much full to have difficulty in taking off and stuck to the ground for digesting the food greedily gulped. With the same ease they can stay at times several days without eating. The adult white-backed vulture has a greyish colouration on the upper plumage of the wings, on which is well visible the ruff of a very pure white (hence the vulgar name) and the neck covered by a slight whitish down that, from far away, makes it seem compleely naked. The chest and the body are of a nice brown colour well visible when flying and in clear contrast with the white underwing and the black remiges. The young is much darker and in the lower part of the wings does not show the white of the alar coverts that are of tawny colour like that of the chest. In this phase it is absolutely indistinguishable from the young of the Gyps rueppellii. When flying, seen from above, it shows an evident very pure white spot over the tail, particular unique in its genus. Is has much robust beak of greyish black colour on a head resulting even small for supporting such an appendix. The feet are equipped with big claws but unsuitable for attacking the victims. It’s typical its behaviour on the ground in ensuring the order of pecking for the access to the food, where it gets very aggressive and is in permanent contrast with young individuals or of lower rank. During these very noisy banquets, the specimens that are fighting emit whistles, puffs and shoutings so strong to be heard also by other predators, like hyenas and jackals that are of course attracted to the banquet by this mess. Like all vultures it has an excellent sight but a scarce sense of smell. When the dry season begins, it builds a nest on the top of high trees, placing the structure on the crown or over the highest branches. It nests in scattered colonies and for this reason at times they occupy all trees available in the chosen area. More occasionally, it can nidify also on inaccessible walls but less frequently than its congener Gyps rueppellii. It is a nest of reduced size if compared to that of the bird itself and with a structure that may appear weak due to the long time and the consumption it must bear during the 60 days of hatching and the 4 months of stay of the chick but does not create problems to the overcoming of these necessities. It lays only one whitish egg with brown spots that is never abandoned fearing the predations to which is subject. Also the chick during the first weeks is continuously governed by the steady presence of one parent while the other takes care in bringing the food. In an case, the predation is always present especially that done during the night by big night raptors or by eagles during the day. 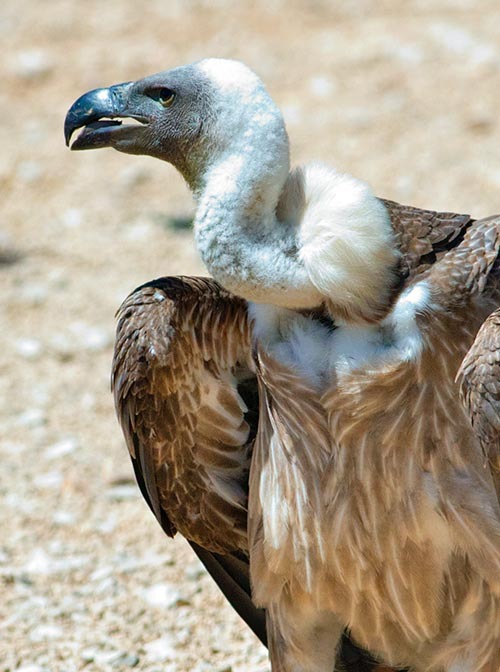 Due to the danger to which has been and still now is submitted, unlawful trade, poisonings, agricultural changes of the territory and various persecutions, the white-backed vulture has been placed in the IUCN red list.